Are churches overlooked in our thinking about the future of cities? The play of colour inside Christ Church Cathedral. Two observations struck me at the time. First, churches often occupy a geographically central location in our cities and they inherit many of the social issues of the urban core. Think of how many churches operate drop-in programs for street people, offer food to the needy, or even house the hard-to-house. Secondly, the discussion reawakened me to the presence of churches as key architectural assets in the city centre. Take a look around at your city: how many churches are located in its downtown? Take a guess, and then check your guess. I suspect that you will find, as I did, that my guess was low. 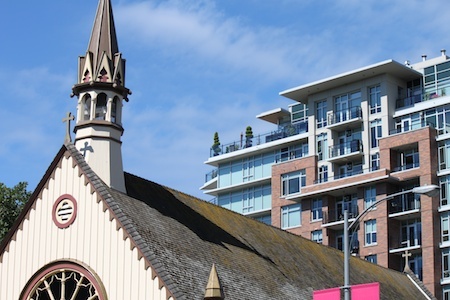 For a closer look at the reality in my home city of Victoria, BC, I took an ecclesiastical walking tour offered by the Architectural Institute of British Columbia. What follows is a bit of a photo essay. Often standing on high ground, churches and their tall spires mark the centre of many cities. Reflecting church and architectural styles of the times, as well as the limitations of church budgets, the spires and towers vary from towering to truncated, from ‘stand alone’ icons to counterbalanced testaments to stability. Monumental in scale, churches communicate interesting nuances in their details. 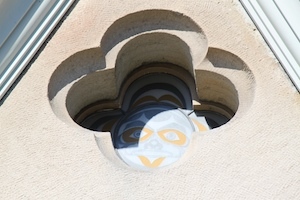 Here, St. Andrews Cathedral offers a connecting point to the original culture of Canada’s Salish Sea west coast, with a portal window that integrates a Salish image. Some of the influences are subtle and easily overlooked in a busy city. 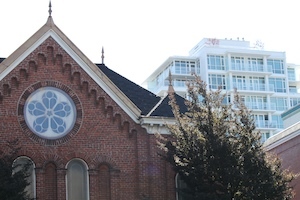 Here, the synagogue of Congregation Emanu-El, on busy Blanshard Street against the backdrop of new condo towers that continue to pop up in around it. Once clad in stucco with its windows covered, the synagogue was restored in the early 1980s. Just around the corner is a church that states its role much more directly. Central Baptist Church is a purely functional mid-20th century structure that is a busy hub of programs. Note the prominent parking sign. This is not a structure that invites design admiration – in fact, our tour leader would have walked right by it without comment if a number of people in our group hadn’t been struck by the contrast. 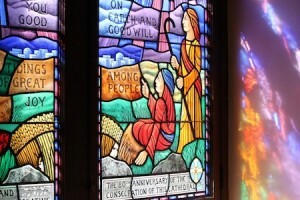 In its own way, this church building makes a statement about its role in the community. 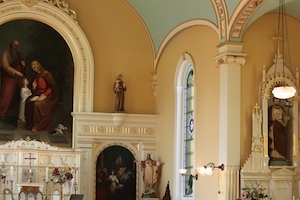 The influence of church architecture is sometimes evident in non-church buildings. On Victoria’s Pandora Street, this contemporary office building sports a spire that links it to others in the neighbourhood, including St. John the Divine (visible just behind the office building). Also on Pandora – a good example of a church building re-purposed. 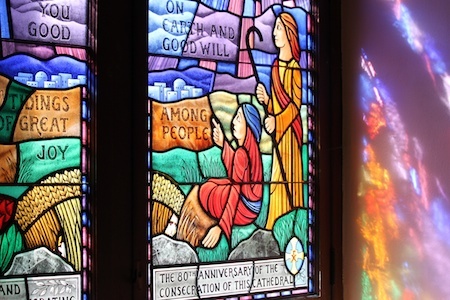 As congregations dwindle and older buildings become a challenge to maintain, it’s not uncommon to find a church building moving into a different community role. 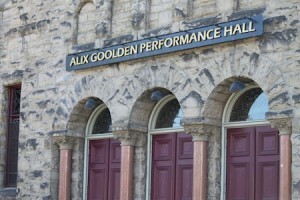 Below, the original Metropolitan United Church built it the 1890s has become Alix Goolden Performance Hall, a fine concert venue operated by the Victoria Conservatory of Music. A stony, imposing structure now housing lively arts. Another re-purposed religious structure is St. Ann’s Academy, a school operated by the Sisters of St. Ann until it was sold to the government of British Columbia in 1974. Abandoned and derilict for some time, it was fully restored to its 1920s look and is now available for weddings and other events. There are many ways to honour the historic role of these churches. Here is Victoria’s oldest church, now known as The Church of Our Lord, as it stands downtown. 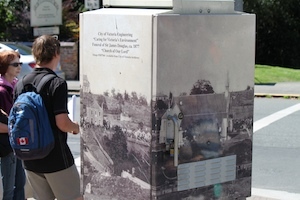 And just across the street, an electrical utility box sports a shrink wrap cover featuring an historic photo of the church. The role of these structures can’t be underestimated in our urban landscape. From their often active role in supporting people who live in city centres to their iconic influence on design and use of space, religious structures tell us a lot about our history, our current needs, and where we might be headed in the future. As our #citychat discussion indicated, this is an aspect of our urban future that planners and urbanists should attend to. Victorians who are inclined to pause and meditate on these or any other thoughts are invited in by a sandwich board sign in front of the city’s most imposing church, Christ Church Cathedral. 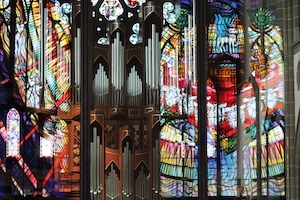 Inside, the stained glass windows and gleaming pipes of the organ encourage reflection on churches past, present and future. The public acquisition of church parking lots offers great win-win potential: badly needed revenue for the churches and parking lots replaced by badly needed European style public squares anchored by these charming structures.